CD review: "Blues & Ragtime"
The best-known practitioner of the Piedmont style of blues from Virginia and the Carolinas, the late Rev. 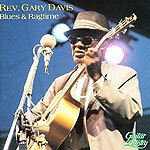 Gary Davis oscillated between gospel and blues during his career. This set is definitely of the blues variety. The lastest entry in Shanachie's Guitar Artistry series, this is an incredible recording for anyone interested in East Coast blues. The recording quality of these tracks, which Davis originally recorded between 1962 and '66, is crystal-clear, and Davis speaks before many of the songs, providing history and context to his performances. Five of the songs are painstakingly annotated note for note in tablature form, right down to the decorative flourishes. Guitar players will go crazy over this release; the rest of us will merely be awed.